A meeting between the director of a nonprofit and its corporate accountant reveals that charitable contributions are down while daily operating expenses are up. The only choice the director has is to cut staff and scale back on the services offered by the program. The director knows this will negatively affect the overall quality of the program. Decisions such as these are made every day by leaders of nonprofit organizations and community programs. The instability of the economy has caused typically generous donors to cut back on their giving. Nonprofits are noticing these cutbacks and struggling to stay afloat. 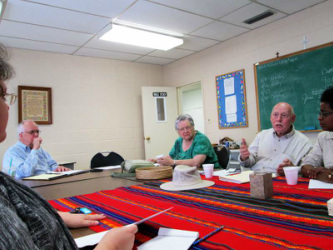 A group of minsters and laity leaders in the Mobile District of the Alabama-West Florida Conference of the United Methodist Church took notice of the diminishing financial support for both Methodist and non-Methodist community ministries in Mobile and Washington counties. Rather than sitting back and doing nothing, they took action. Having experienced a situation similar to the one mentioned above, Pastor Charles Fail has become instrumental in the development and future success the Resale Store of Open Doors, Inc. In June 2012, this group of ministers and laity leaders decided to create a nonprofit corporation called Open Doors, Inc. Don Woolley, one of the founding members, states that the organization came from a desire to get out and “start doing.” The founding members agreed that more could be accomplished through collaboration and joint effort. The first development project for Open Doors, Inc. was the opening of an upscale resale shop. The Resale Store aids in developing and supporting multiple ministries in the south Alabama area. Fifteen percent of all gross revenues from the store go into a distribution fund that is allocated in support of Methodist and community ministries in the area. United Methodist affiliates such as Dumas Wesley Community Center, Sybil Smith Family Village, the United Methodist Inner City Mission, and McKemie Place could all benefit from the efforts of Open Doors, Inc.
Each year in March, organizations can submit an application to Open Doors, Inc.’s disbursement committee that documents legal status, sound financial management, and acceptable achievements and outcomes. Based on recommendations from the disbursement committee, the board of directors decides which agencies/organizations will receive funding and the amounts they will receive no later than May of that same year. Funds are then distributed starting in July. Currently, the Resale Store is being run out of the old Pleasant Valley United Methodist Church in Mobile, Alabama. The Open Doors, Inc.’s board of directors is actively seeking a store front location to permanently move the store to. The store is open for business the third Thursday, Friday, and Saturday of each month. Once the store moves to its permanent location, the store will be open daily, Monday through Saturday. As Open Doors, Inc. continues to go forth it its efforts, it is the hope of the board of directors that they will be able to help numerous nonprofit organizations in south Alabama. The group is focusing most of its attention on developing the Resale Store and making it fully functional, since the revenue from the store is how the organization will be able to offer financial assistance to other nonprofit organizations. “I believe in the Resale Store and I know that it can be successful and very profitable,” says Pastor Charles Fail, director of the Resale Store. He prays that one day the Resale Store will become self-sufficient with its own paid staff, and not be solely dependent on volunteers to run it. It is his heart’s desire to see the store succeed, and he has even committed himself to be the store’s director once it reaches the point of being open on a regular basis with paid staff. When talking about the future of the Resale Store, Pastor Fail says, “We have to go down every path…until God shows us the path that we need to be on. I envision this big store.” With the drive of people like Pastor Fail, and the dedication of all of those serving on the board of directors, Open Doors, Inc. will no doubt make a major impact on the Mobile community. They have already made an imprint and are living up to the United Methodist motto: “Open hearts. Open minds. Open doors.” As Open Doors, Inc. fulfills its mission to “fully engage United Methodists in expressing God’s love by sharing the good news of Jesus Christ through holistic ministries that transform [its] communities,” the corporation will touch countless lives.